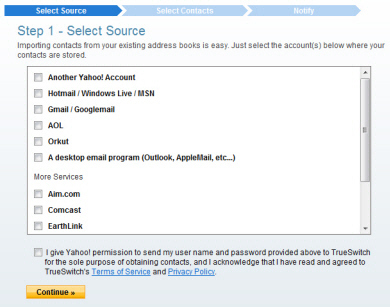 When switching to Yahoo Mail from another webmail service like Hotmail or Gmail, or an email program like Outlook, Windows Live Mail, or Mozilla Thunderbird, you do need to re-create all your address book contacts by hand: Yahoo lets you import contacts from other sources, which will then become regular Yahoo Mail contacts. This tutorial will show you how to import into Yahoo Mail contacts you exported to files from other email programs or webmail clients. First, access your Yahoo Mail address book by clicking on the Contacts link in the left pane, below the Trash and your custom email folders. From the Contacts tab Yahoo just opened, click on the Tools menu, and choose Import. The next screen that loads contain a "Popular Tools" header, with a Import Now link displayed second: click on it, and Yahoo Mail will load a splash screen letting you get contacts from other sources; we will first show you how to import your Facebook contacts, and then explain how the Contact Transfer tool works (this tool is used to import all contacts but Facebook's). Yahoo Mail may show you the following screen when choosing the Import command; this new feature allows you to import your Facebook contacts into Yahoo. 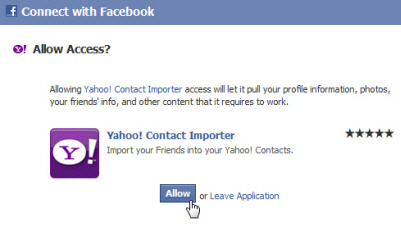 If you click on the Facebook, a new window will open to the Facebook application that transfers your contacts to Yahoo. If you click on any other option ("Gmail", "Windows Live Hotmail", or "Others"), the contact transfer tool will take over, as described in the rest of this tutorial. For more information, please see our Facebook tutorial. In "Step 1 - Select Source", Yahoo lets you pick from which source contacts will be imported; the most common choices are Another Yahoo! Account, Hotmail / Windows Live / MSN (three names for the same webmail service, Gmail / Googlemail (an alternate name for Google's email service in some countries), AOL [Mail], Orkut, or A desktop email program (Outlook, Apple Mail [Mac Mail], etc.) The second set of services include less popular services and/or ISP's (Internet Service Providers) which offer an email service of their own (currently including Aim.com, Comcast, EarthLink, Freenet.de, Laposte, Verizon, and Web.de). You can select more than one source of contacts: in the case of web-based email services, clicking on the corresponding checkbox will load a mini form to collect your user name and password. Yahoo will use this information to login to your account, and import all contacts from there. The next screen gives you the ability to selectively pick the contacts to import; either pick only some of your contacts, or click on the Select All checkbox to import all contacts. When you are done, click Import. After a few seconds (depending on the number of contacts you have selected for import), Yahoo will bring you to a confirmation screen that displays the names (or email addresses) of all contacts successfully imported in your Yahoo Mail address book. You are done! And you can either close the window, or click Import More to bring new Yahoo Mail contacts from other address books. Once you go back to your Yahoo emails, click on the Contacts link in the left pane to bring up an up-to-date contact list from your address book: the total number of contacts indicated between parentheses should now be the total of all the pre-existing Yahoo Mail contacts, plus the newly imported ones.